This block allows for precise control of one motor’s speed. Unlike the move block, the Motor block can ONLY control one motor so you can achieve maximum accurateness. You can "ramp up" to a set speed or "ramp down" to a stop. By deselecting "Wait for Completion," your program can move on to the next block once the Motor block has started a motor. The display block allows us to "display" an image on the screen of our NXT Brain; the Display Block configuration panel shows that we can display shapes, text, or even a user made drawing! If you don't want the same picture to be running the entire program, then add another Display Block and from the drop-down menu, check clear.If you would like to return to the default LEGO MINDSTORMS icon, select Reset in the menu. The screen measures 100 pixels wide by 64 pixels high. 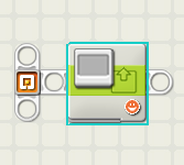 The icon in the bottom right shows whether the block is set to display an image, some text, or a drawing; or whether it will just reset the display to the default icon. You can change values dynamically by connecting data wires to this block’s data hub. Who knew the Color Sensor made such a good flashlight? You can use the Color Lamp Block to control the Color Sensor’s lamp function. You will need one Color Lamp Block to turn the lamp on and a second Lamp Block to turn it off during a program. The number at the top right corner of the Color Lamp Block shows which NXT port will be controlled by the block. You can change this number in the configuration panel if you need to. The red icon in the picture shows whether the block is set to turn a lamp on or off and what color is turned on. You can drag data wires from other blocks to this block’s data hub that will affect the Color Lamp block’s properties. 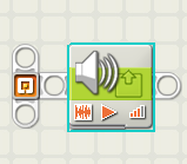 The far left icon shows whether the block will play a sound file or a tone. The center icon shows whether the block will start or stop playing a sound. The far right icon shows the block’s volume. An icon with four orange bars is set to the loudest volume. You can drag data wires from other blocks to this block’s data hub that will affect the Sound block’s properties. This block allows you to send a wireless message to another NXT. To send a wireless message (after all NXTs have been configured with connection numbers), first select the connection number of the target NXT. Then choose the message format (Text, Number, or Logic). Input the message by typing in some text or a number, or choosing a logical condition (true or false). Finally, choose the mailbox number (where the message will be stored) at the target NXT. The message format and the message itself can also be specified by using input data wires. This is the connection number of the target NXT (that is to receive the message). The message type and the message itself can be supplied dynamically using input data wires. The output plugs to the right will pass any input information through to other blocks, if necessary.